Body style: DeGennaro's own original Teardrop design. Soundboard: Aged sitka spruce that I rescued from a piano factory I worked in years ago. It's piano soundboard wood. Sides & back: Hand-picked honduras mahogany, marketry inlay, carved. Fretboard: Ebony with m.o.p. and abalone flowered inlay. Headstock: Mahogany with highly figured cherry veneer, back of the headstock is carved. Truss cover: M.o.p. & abalone. 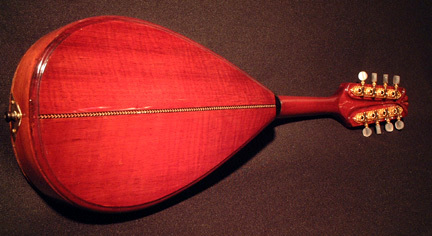 Sides & back: Hand-picked honduras mahogany, carved. Fretboard: Ebony with m.o.p. dots. Headstock: Mahogany with highly figured maple veneer. 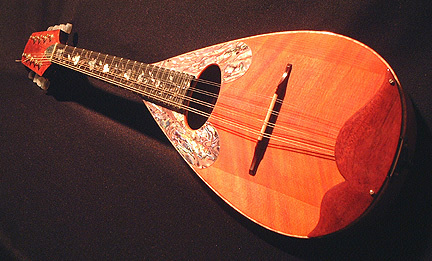 This is the DeGennaro Power Mandolin. 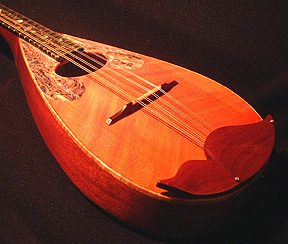 It is an electric mandolin (something that will allow you to hold your own next to guitars and basses an drums. We will get better pics up soon.. This paint job, although interesting up close, doesn't show the shape of the instrument very well in pictures, but there will be more on the way. Finish: Nitro celloluose lacquer with an experimental paint job (pictured one).